holds a 3.5 x2.5" photo 7"H Resin stone mix/glass, 3D Shadow Box Frame w/glass front and imprinted poem. Verse: The tender Embrace of my grandchild fills my heart with unconditional love. I've become a grandmother ... I've become a grandmother. 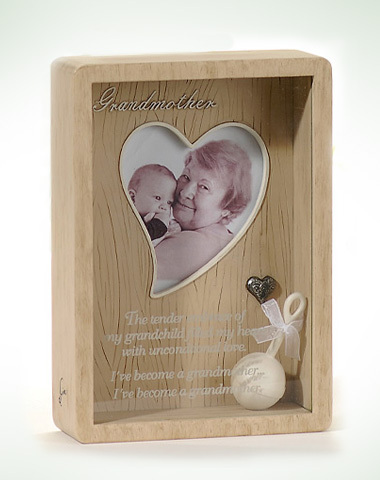 Celebrating a proud and loving grandmother and her tender embrace of love, this shadow box frame may be placed on flat surface or hung on the wall. Personalize the frame with your own photo. This special piece can coordinate in the babies nursery or be displayed anywhere in the home or office. Makes a great gift for grandma!